I am so grateful to radical feminists. I think about my attitude towards cooking, and the reasons I do it, and I keep coming back to feminism. I hate the idea of doing something because it is what is most appropriate (that word conjures up images of stern old people with disapproving snarls). Feminism, in many ways, gives that notion the finger, and drills into the minds of all women ‘do not be constrained by societal expectations. Ask for what you want, do what you want’. The achievements of yester year feminists, their resilience and their absolute resolve to never back down imbued me the ability to choose. Housewives of yesteryear cooked for their husbands and families largely because it was their role. It was a duty dictated to them. Every person needs to eat and someone needs to provide that. While I have no doubt they prepared food for their families for love, they also cooked because that was their inescapable duty. Feminism has given all women the right to choice. A woman can choose to stay at home and assume ‘wifely’ responsibilities not because she HAS to but because she WANTS to. So much of how much of my love is expressed through food, what I cook, how I cook, who I cook for. 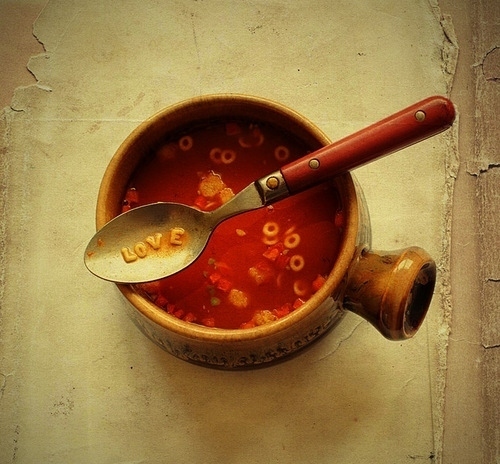 I think that fact that I choose to create delicious food makes it a more powerful declaration of love. I have wanted for a long time to write a cookbook called ‘Seduction Begins in the Kitchen’. I was inspired to do this not long after I got together with my current partner. We had been dating for a couple of weeks and we were both getting that lovely tummy tickle that says ‘this is going to be special’. Anyway, he cancelled a date with me, saying he had come down with one of the hideous cold bugs that inevitably mutates several times and does the rounds in Canberra. Having been brought up in the Cosmo and Cleo era, I squashed my first impulse, which was to offer to bring him soup (it’s important not scare men off by being too keen after all.) And then I thought, ‘f**k it’ and asked him if he’d like me to come over and cook him something nice to eat as he was probably feeling too horrid to do it himself. After assuring him that I didn’t care if he wasn’t going to be good company, he was sick, and needed to be taken care of. The preparation and serving of food is a declaration of love made all the more powerful by the fact that we choose to do it. Thank you feminism! 1. Heat a splash of olive in a large pot. Add the onion and ground coriander and allow to sweat for ten minutes over medium heat (the onion should become translucent, not coloured). Add the carrots and the leek and cook for a further five minutes. Add the garlic, ginger and chilli and cook for thirty seconds. 2. Add the chicken, stock, coriander roots and a generous few grinds of pepper and bring to the boil. Simmer for 45 minutes. (It’s very important to not overcook the chicken otherwise it will be stringy and tasteless). 3. Remove the chicken from the pot and place in a large bowl (the juices will continue to drip out, this way you can pour them back into the pot). Once the chicken has cooled (give it about five minutes) remove the skin and shred the flesh. 4. Place the chicken pieces back in the pot and add the lemon juice. Serve with a sprinkling of fresh coriander and parsley. Note: I drew a lot of inspiration for this recipe from Monica Trapaga’s lovely book ‘She’s Leaving Home’. I come back to this recipe every time I have a nasty cold. It’s the best. Thank you!! This entry was posted in Featured, Food and tagged a yummy substitute for maccas, food. Bookmark the permalink.